Success Story: Contemporary Controls Helps Coventry University "Go Green"
There is an increased interest for more sustainable energy solutions. More and more businesses and other organizations are demanding environmentally friendly options, and universities are no exception. Using the Contemporary Controls BASgatewayLX Communication Gateway and EISK5-100T 5-Port Skorpion Switch, Coventry University (Coventry, UK) was able to implement two innovative energy solutions. 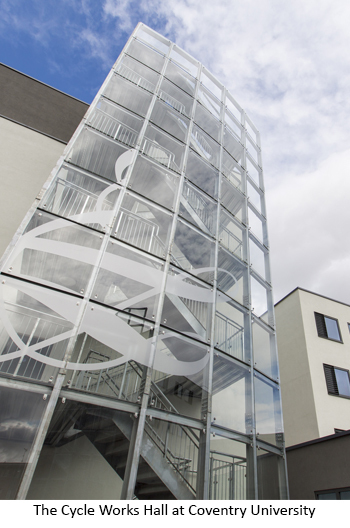 The university installed a high efficiency low-emissions (HELE) biomass boiler at their Engineering, Environment, and Computer Building along with a combined heat and power (CHP) system at their newly built Cycle Works student housing property. The CHP provides lower energy costs with reduced C0x and N0x emissions. Modbus remains a popular network interface, particularly for boiler controls, but these devices lack BACnet compliance. The BASgatewayLX Modbus to BACnet/IP Gateway provides the integration between the Modbus TCP biomass boiler and the BACnet/IP network at the Engineering, Environment, and Computer Building. A total of 118 system points are monitored. The virtual routing feature in the BASgatewayLX allows each connected Modbus device to appear as an individual BACnet compliant device. All that is needed is a device profile for each Modbus type device. Our new firmware 2.0.1 has increased the maximum number of mapped Modbus RTU or Modbus ASCII devices to up to 100 devices and 1000 points. Contemporary Controls maintains a library of common device profiles. If one is not available, Contemporary Controls will provide it upon request. University residence halls are not "dorms" anymore. Today's collegiate housing facilities are lively, state-of-the-art, and green. In the highly competitive education sector, colleges and universities view residence halls as extensions of their academic brand. The Cycle Works utilizes a combined heat and power system and has 48 power meters spread throughout the building to monitor energy usage. They communicate over Modbus and utilize two BASgatewayLX gateways to integrate into a BACnet/IP building management system. 422 system points are monitored. An EISK5-100T Skorpion Switch consolidates four Ethernet devices at the main panel into a single data point. This rugged plug-and-play Ethernet switch provides 100 Mbps performance and requires no configuration. All ports automatically configure their data rate and duplex using the Auto-Negotiation protocol. The BASgatewayLX Modbus to BACnet Gateway is part of Contemporary Controls' BASautomation line of products that provide gateway functionality between Modbus serial (ASCII, RTU) or TCP devices and BACnet/IP. These rugged metal enclosed devices are DIN-rail mounted and powered from a 24 VAC/VDC source. Learn more on the BASgatewayLX and EISK Skorpion Switch product pages.